As we shift into the latter portion of conference games, I want to take a moment to view the landscape of a few conferences that have seeding implications for impending conference tournaments. Before I do this, I want to speak to one of the more interesting Butler basketball games I have attended. 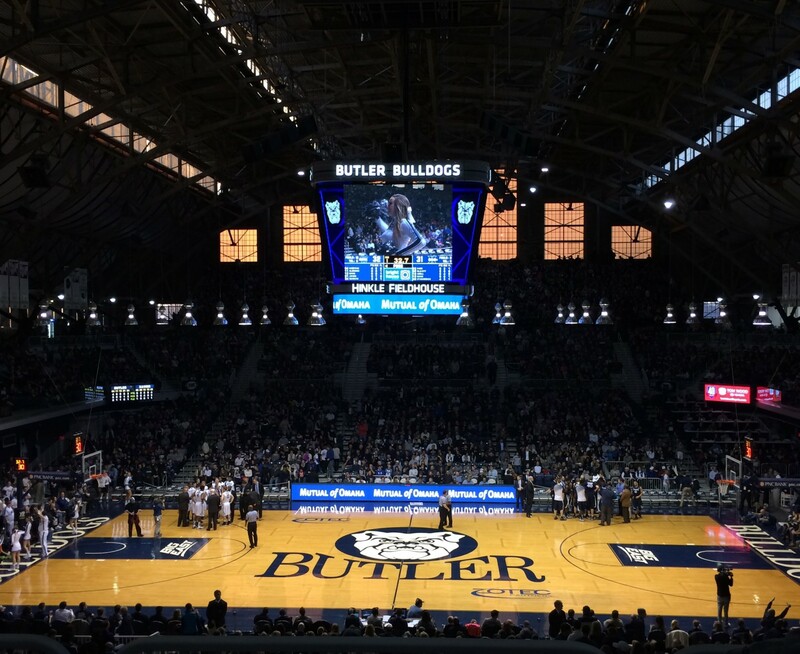 Yesterday evening, Butler hosted St. John’s in what I’d consider to be a more bizarre college basketball game. I was curious about how long Butler games typically last, so I decided to time this game from tipoff to the final whistle. In all, it took 2 hours, 14 minutes to complete the game. Tipoff didn’t occur until about 8:45pm for what had been a scheduled 8:30pm tip. Butler won the game 110-86, giving the Bulldogs their first Big East game scoring 1oo or more points in a game. A decent portion of those points were scored from the charity stripe. In what seemed to be the longest regulation game this year, a total of 53 fouls were called (included 3 technical fouls) and 77 free throw attempts were taken. Butler was 29-of-40 from the free throw line and St. John’s 27-of-37. The numbers above aren’t breathtaking, but if you watched the game, there was little flow for a majority of the second half. Some of the loudest cheers from the crowd were from put-back dunks by Tyler Wideman. There was one play which fresman, Kamar Baldwin, drove hard to the basket, went up for a contested dunk. The ball bounced up off the rim and Wideman followed up the missed dunk by Baldwin with a put-back dunk of his own. Unfortunately, those points were waived off because Baldwin had been fouled on his shot attempt. Fans naturally headed towards the exit earlier than usual because of the late start time. Those that stayed were treated with one of the loudest cheers I’ve heard in Hinkle with it filled halfway. That estimation may be generous – I don’t know, I was tired and ready to fall asleep. Walk-on, Steven Bennett, (who was recently given a scholarship in his final season suiting up in a Butler jersey) received chants from the student section, lovingly called The Dawg Pound. “We want Bennett” and, “Steven, Steven…” echoed among the rafters from the under-4 timeout until the announcer called, “One minute to go”. As Bennett rose from his seat on the bench, took his warm-ups off and jogged to the scorer’s table, loud cheers from fans all throughout the arena continued to rain down. I’m sure you can see where this is going. Butler had possession of the ball with about a 7 second difference between the shot and game clock. Bennett received a pass just beyond the right elbow, dribbled, picked up his dribble and frantically looked to pass the ball. The man defending him, backed away and gave Bennett enough room to take a jumper from the elbow. As the ball fell through the hoop and was caught the net, you would have thought Bennett had beaten the best team in the nation on a last second shot. It was fun seeing him shed a smile and his teammates support him in a positive manner. He had scored his first basket of the season. With other games played in the Big East last night, there was some shifting in conference standings. Xavier lost to Providence and Creighton lost to Seton Hall. With Butler’s win, the Bulldogs have sole possession of second place, 3 games behind Villanova. Creighton and Xavier are tied at 8-5 in the conference with the tie-breaker going to Creighton. Last night, Butler played to win rather than not to lose. There was a game-plan that the Bulldogs executed well. I think they played too fast at times, but St. John’s seemed to find a way to play out of control, a style which they have identified with often this season. In the recent stretch when the Bulldogs lost 3 of 4 games, I became concerned with what Butler’s identity was as a whole team. So often through the 2000’s and early 2010’s, Butler squads were defined by their stubborn defense and high resiliency, not letting them beat themselves. With the new rule changes on foul calls, Butler’s perimeter defense has declined because of how tightly calls are made around the 3-point arc. I think the realistic perspective for Butler in their final four regular season games is that they achieve a 2-2 record. They host DePaul this Sunday, travel to Xavier and Villanova, and conclude with a home game against Seton Hall. It would be a huge confidence boost to win one of the away games, but Butler’s recent record playing at the Cintas Center in Cincinnati is not great. I arbitrarily picked the 2013-2014 season as the furthest I would go for research for the sake of recency. I think the further back you go when investigating trends in head-to-head matchups, the less weight games have at painting an expectation of what to expect when the teams play soon. In the last three games the Bulldogs have played at Xavier, they have lost by 11 (2014), 17 (2015), and 19 points (2016). In their past 8 matchups, including home and away games, and the Big East Tournament, Butler owns just 2 wins. The ebb and flow in college basketball trends is never ending, which gives continual hope that some day, Butler will put together a long stretch of success against Xavier. Will this be the beginning of that new winning trend? I can only be positive and hope it is so. The Big Ten Conference is in a down year. The bright spots are from Wisconsin, Maryland, Purdue, and Northwestern. Northwestern gets a nod at being a bright spot because I think it has done enough to solidify their first invitation to the NCAA tournament. They currently sit in 4th with an 8-5 conference record. Maryland has been an interesting team to observe over the season because they didn’t play a comparably tough non-conference schedule. The teams they did beat that garner more attention because of brand name of the school were home games, games Maryland should win. I still don’t think the Terrapins are a team that can really make noise in March. They have a top 50 offense and top 50 defense, but I don’t see them winning after the Round of 64. If they win out the rest of the regular season and play decently in the Big Ten Tournament, my opinion will change, but for now, I don’t think Maryland is going to do much in the tournament. At the moment, I think Caleb Swanigan is the favorite to win player of the year. His consistency in scoring and rebounding has been a key in the Boilermaker’s success. Moving forward, the concerns for Purdue that need to be addressed are their ability in reducing the amount of turnovers each game. If they can take care of the ball, they are a good pick to take into the second weekend of the tournament (depending on how they matchup). One thing to note is in each of their five losses, they have never lost by double-digits. I don’t know what to make of this year’s ACC. The body of work as a conference, as a whole, has been je ne sais pas (French for “I don’t know what”. Yes, the teams that currently sit in the top half are the ones I expected to be there, but there have been glaring blips, in my opinion, over the course of the season. To be fair, the beginning of the season is a bit more volatile when it comes to upsets. Duke is steadily developing into the team that I thought it could be, but I still think they have underperformed compared to the expectation placed upon them at the beginning of the season. Their win against Virginia was important for them moving forward. In the past four seasons, Duke is the only ACC team with a winning record against Virginia – a statistic that is complimentary to both teams. I think the most surprising team has been Georgia Tech. Their offense isn’t horrendous, but it doesn’t work well. They have an incredibly efficient defense which is what has helped them to a 6-7 conference record, boasting wins over North Carolina, Notre Dame, and Florida State. I don’t know the odds that 6 teams would be within 2 games of each other after playing 13 conference games, but one thing seems to be consistent with this group of teams – they are average. Central Michigan’s Marcus Keene has had an exceptional season to this point though. He recently broke Dan Majerle’s scoring record at Central Michigan for the most points scored in a single season. Keene currently sits at 775 points. He has scored at least 40 points in a game 5 times. His highest point total came against Miami – Ohio last month where he poured in 50 points. The two teams faced each other again less than a week ago on February 11th where Miami-Ohio’s game plan was most likely to keep Keene from shooting the ball. He took 6 fewer shots than in that game and was held to a season low of 12 points. I wonder how often the same player has their season high and low for points scored in a game. Keene currently sits in a tie for 91st overall for points scored in a single season since the 1992-1993 season. Since the last update I gave, Illinois State was leading with an unscathed conference record with Wichita State owing its one loss to Illinois State. The teams are currently tied for first at 14-1. Here is what I find most fascinating about this conference to this point in the year that hasn’t received attention at all: Northern Iowa, entered conference play with a disappointing non-conference record of 5-6. They proceeded to lose their first five conference games, dropping them to 0-5. Since their abysmal start to conference play, the Panthers have won 9 of their last 10 games, slotting them into third place at the moment. Anticipate the next few posts to be related to the NCAA tournament, specifically the make up of a potential champion and identifying potential Cinderella’s in the tournament.